Baingan Ka Bharta, an authentic Indian dish, is a delicious combination of grilled brinjal (cooked over direct flame, roasted one) and uncooked spices. Baingan is rich in vitamins, magnesium, potassium and low on fat and sodium, making it ideal vegetable for heart and BP patients. 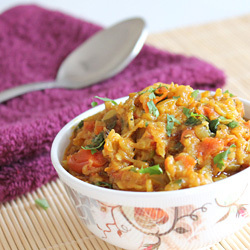 Learn how to make irresistible baingan ka bharta with raw spices at home with this easy recipe. 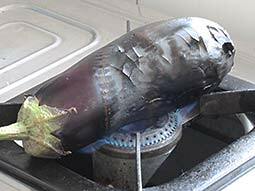 In the first step, we would roast brinjal (baingan / eggplant). Take a big round/oval shaped purple or light green brinjal for this recipe. Slit brinjal a little on each side by knife. Place it on a gas cook top and roast on direct flame of burner. 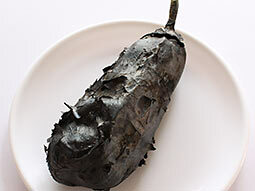 When skin of brinjal turns black and flaky, turn it on other side. Keep turning the brinjal to cook it evenly all around its surface. 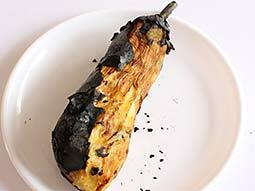 When the whole surface turns black and brinjal becomes soft, turn off the heat and let it cool a bit. Peel black skin completely and put it in a plate. Mash the flesh with knife or spatula. Add green chillies, salt and pour lemon juice over it; mix well. If you do not like sour taste, then you can avoid lemon juice. Sprinkle red chilli powder and coriander powder. Pour raw oil over it. Garnish it with coriander leaves. Baigan ka Bharta with raw spices is ready to serve. Garnish with chopped raw onion for variation. Use groundnut oil or sarson ka oil for best oil flavor. 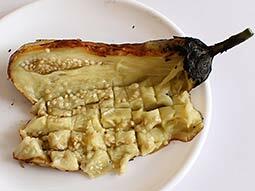 Taste: Spicy and yummy taste of roasted brinjal with aroma of raw oil and spices. Serving Ideas: Serve it with any Indian bread like chappathi, roti, bajra roti, Makki ki roti etc.